Dr. Charlie Veron is a prominent marine scientist known as the ‘Godfather of Coral,’ having discovered 20 percent of all coral species in the world. He has worked in all the major coral reef regions of the world, participating in 66 expeditions and spending 7,000 hours scuba diving. 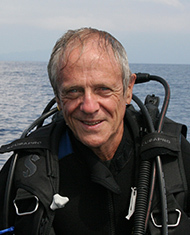 Veron was formerly the Chief Scientist of the Australian Institute of Marine Science and has authored over 100 scientific articles, including 14 books and monographs. He has been the recipient of the Darwin Medal, the Silver Jubilee Pin of the Australian Marine Sciences Association, the Australasian Science Prize, the Whitley Medal and received special mention in the Eureka Awards. Today he continues to work in many different fields although he concentrates on conservation and the effects of climate change on coral reefs. He predicts that if humanity continues to produce carbon dioxide at present rates, coral reefs will vanish in the next few decades.